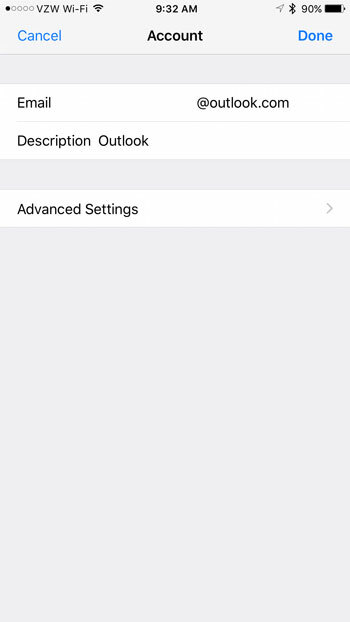 Home Apple iPhone Why Isn’t There an Option to Change My Email Password on My iPhone 7? Why Isn’t There an Option to Change My Email Password on My iPhone 7? You can check the status of your email provider at DownDetector. Links for the three big email providers are shown below. The iOS 10 update that comes pre-installed on the iPhone 7 includes a number of new features and updates that were not a part of earlier versions of the operating system. Some of these features are very welcome, while others might at first seem to be a bit on the confusing side. One such confusing change is that you might not be able to change your email password. Previously this had been something that you could change at any time (by going to Settings > Mail, Contacts, Calendars), like the name that appears on emails you send, but now it is conspicuously absent. The reason that you do not see it is actually because the ability to change the password is not visible unless your iPhone is having trouble communicating with your email server. If you sign into your email account through a browser, such as by going to https://mail.google.com or https://mail.yahoo.com, and change your password using the method that those providers suggest, then your iPhone will provide you with the option to change your password from a screen similar to the one shown below. You can find this option at Settings > Mail > Accounts > then select the email account that needs to be updated. Note that many popular email providers interact on an account level with iOS 10, and your password may update automatically on your iPhone if you change it in a browser. 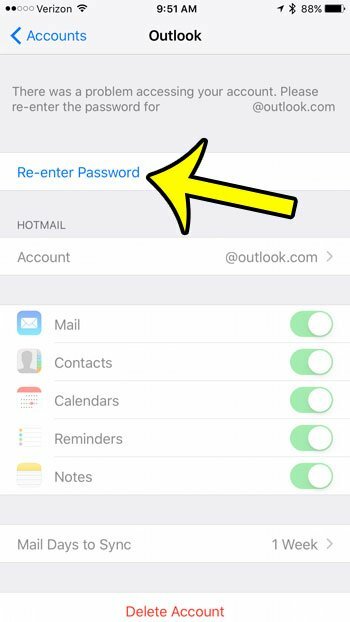 If you are changing your password because an unwanted iOS device has access to it, then you will need to revoke permissions for that device through your email provider. Are there apps on your iPhone that you don’t use, but are taking up a lot of space? This article will show you how to remove GarageBand, which takes up a lot of storage space if you aren’t using it.